australianbidet.com is the largest supplier of Bidets, Electronic Bidet Seats, Integrated Toilet Bidets, Non-Electric Bidet Seats, Bidet Attachments and Personal Hygiene products for Australia, New Zealand and South-east Asia. At RNJ Group, know that no two customers or any two bathrooms are the same and for that reason we prefer to ensure that our customers make the right decision when choosing a bidet product, taking into account their individual needs and their particular bathroom. Our Philosophy is to provide the most superior service possible to our customers and clients, knowing that our knowledge and technical expertise will ensure that they will always receive the right product for their situation and their needs. australianbidet is the largest and fastest growing company in the Australian bidet industry. Established in 2005, our company has expanded our range to be a one-stop shop for your accessability bathroom needs. We strive to be leaders and innovators in the field of bidets, bidet equipment and bidet accessories. We are consistantly looking for new products to enhance your lifestyle, and quality of life, so you can have a great looking but functional bathroom. We have just added Kohler and Englefield to our range of toilet suites, pans and bidet seats. Whether you are just concerned about personal hygiene or you are a senior citizen, disabled or have impaired motor functions, we are confident that we can help you find the right bidet for you. We pride ourselves on our service, and we would like to speak to you to get the right toilet, washlet or combination that will suit your needs. 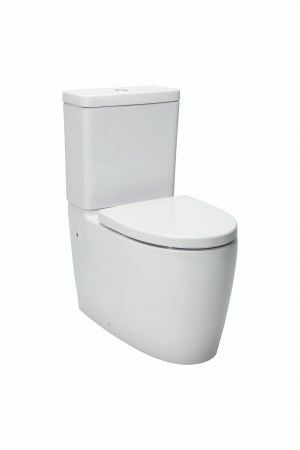 If you are unsure if your toilet suite or pan will fit neatly with a Bidet seat or want to change the toilet suite, then please give us a call we can help you in your purchase and after sales service that does not compare to any other company. If you call our team on 1300 883 766, they will help you to select the most suitable product from the extensive range of sophisticated bidet products displayed here on this website. A favourite at australianbidet.com, the Kohler rimless pan... the Grande.